*GIVEAWAY CLOSED : Abby and Sy Pie were the winners who were randomly selected and contacted. I would like to welcome our newest sponsor Love & Victory and they are sharing with us a little giveaway that is perfect for the upcoming Mother's Day holiday! Two lucky readers will win a custom framed hand-cut silhouette in the color selection of their choice. They kindly did a silhouette for our girls above so you can see what the final product will look like. See all of the options to get your creative juices flowing. Enter by commenting on this post by Sunday night and the winners will be announced here on Monday. Welcome Love & Victory! Be sure to check out all of their great gifts here. *If you would like to become a Black Eiffel sponsor email blackeiffel@gmail.com. 20% of ad proceeds will also be donated to the Japan relief. These are stunning! What a beautiful way to preserve a memory. How do you enter the Giveaway? What an amazing giveaway! I've always wanted to get one done and this would be a perfect gift for my mom! They're beautiful! We're incorporating silhouettes into our upcoming wedding. Love them! Is a comment considered an entry? If so, consider me entered - and charmed. Love them! So beautiful in black. I would like to enter! these are great. I'm in. I love a classic silhouette. Would be thrilled to win. We are newly weds, and these would be so adorable in our first place! I have been eyeing these for quite sometime. My bf is moving away for awhile and I would love to give him one as a parting gift. Please consider this my entry! Assuming that posting a comment makes one eligible for the giveaway but it wasn't indicated in the post. I'd like to enter! This would make a great 1 year birthday gift for my niece (or should I say, for her parents). Would love to win one of these - love them! I'd love those on my wall! These are wonderful! This would be such a great win! Gorgeous! Would love to surprise my mother with these for mother's day! I never grow tired of silhouettes! Time to update ours. Those are awesome - definitely consider this my entry - i'd love to get a pair of my fiance and i for our engagement annoucement! Lovely! I'd love to have one of my little girl! I'd like to enter too! What a great giveaway! Lovely and yes, perfect for Mother's Day. Oh these are so pretty. I'm a sucker for silhouettes. Beautiful. I would love to enter the giveaway... My son would look so adorable. These are so, so lovely! I'd love to use them in my new apartment. though here, in CEE mother's day is celebrated at the beginning of March, this would be an amazing gift for my mother. I just found a silouette of my boyfriend from when he was young in his old box of school things while we were moving...I can't wait to fame it! Groupings or doubles of them are the best. I hope I win! What a perfect gift! I would love to enter as well! So classy and so very Victorian - I love them! I love love love silhouettes! Great giveaway! How are we supposed to enter? I would LOVE one! Oh I've wanted to do this for my kids. Oh - I've wanted to do this for my kids for a while. so sweet, I would love to have one of my dog. I love them! They would be the perfect gift for my sister, a new mommy! Wow! These are fantastic. I've been trying to think of a great gift for our upcoming wedding - our silhouettes be perfect. Thank you! I agree with everyone above when saying these are beautiful! What a beautiful gift for our moms! enter me too please ; ) i love the white and marigold colors! Count me in! I was planning on doing one of these to commemorate my mom at my upcoming wedding. This would be a dream come true as they do a much better job than I ever could! I am a huge fan and already had them "liked" on my Facebook. what mother doesn't want one?! thanks for the chance to win! I love Love & Victory and already have them "liked" on my FB page! Fabulous! 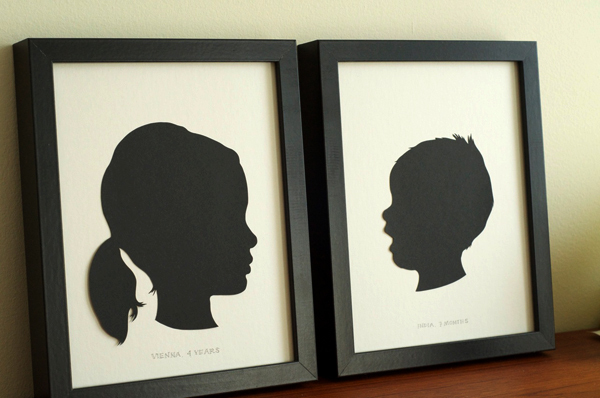 I'd have them made of my nieces' profiles, and then give the artwork to my single dad brother for Father's Day. Can French people participate? If yes, I'm in ! Oh my. These are so sweet. I would have a hard time deciding who to get silhouette's made of, but they are certainly beautiful! perfect way to capture a time - logging a series would be amazing. These would be perfect for a wedding gift! This would look perfect on my wall of prints in my apartment :). I love these. I'd like to think I could make some myself but know they'd never turn out this beautiful. What lovely work! (Almost) Makes me wish I had kids to have their silhouettes made! I've been obsessed with silhouettes for 7 years... and my obsession hasn't died at all. I need these! they are so beautiful! i think/hope that silhouettes are timeless. I would love to win this & have a silhouette portrait made of my godson Isaac & give it to his mama on Mother's Day. Thanks for the chance to win. xo. LOVE this giveaway! I've been wanting these for my kids room.... so cute! Love the color options. The only cute little ones we have in our family are furry ones and I think a silhouette of a furry family member is perfect!!! so love silhouettes, i have one for my both my oldest youngest daughters for some reason my middle daughter never had one made. would love to get one. thanks for the introduction to your new sponsor ! These are beautiful. Thank you!! Yay, so lovely, I am in! oooooh - I have always wondered how one of these would turn out! I would love to win one of these. It would be so perfect for my best friend as a mother's day gift. oh my goodness i would just love to have a silhouette done professionally! absolutely beautiful!! i want them too! specifically for my precious puppy huckleberry! So precious. I'd love to have one of these of my new baby! How beautiful -- I've been wanting to do silhouettes of my two kiddies for ages. what a great Mother's day gift! I love silhouettes! A family of them would be perfectly sweet in our dining room. I'm dreaming of having silhouettes like this over our bed! Adorable! I've wanted to do silhouettes of my family for awhile now and these would be great. Thanks for the fun chance to win!! So fun! This would make an amazing gift. These are beautiful. I was hoping to make a silhouette for an oval frame that I just hung over my daughter's bed. Last week I painted the antique frame (from green to a creamy white) and found a pretty pink damask background paper for the inside. However, creating the silhouette feels daunting. Please enter me in your giveaway. Ohhhh, I love it! My fingers are crossed! How cute is this :D Got to love, right? Beautiful! I would love one of my husband. beautiful! so simple + timeless. So precious! They are absolutely adorable. gorgeous! I have 4 little ones whose sweet faces I would love preserved! i love these! this would be perfect for my husband to give to me for mothers day of my new baby boy. lucky for him i read your blog so he always know just what to get me for all occasions!